Victoria Sork, a renowned plant evolutionary biologist, has served as Dean of Life Sciences Division in the UCLA College of Letters and Science since 2009, has also served as Senior Associate Dean of the David Geffen School of Medicine at UCLA). Managing the Life Sciences Division is a major task that requires skills that go well beyond pure science. Indeed, Life Sciences encompass a wide variety of departmental and interdepartmental programs (Computational and Systems Biology; Ecology and Evolutionary Biology; Integrative Biology and Physiology; Microbiology, Immunology & Molecular Genetics; Molecular, Cell and Developmental Biology; Neuroscience; Physiological Science; Psychology; and Society and Genetics) and include seven affiliate Institutes and Centers. The Division includes about 250 teaching faculty, 500 graduate students, and 7000 undergraduate majors. The UCLA La Kretz Center for California Conservation Science – A center of excellence dedicated to preserving California’s biodiversity and ecosystems through research, education and public programs (a partnership with the Institute of Environment and Sustainability). The Institute for Quantitative and Computational Biosciences (QC Bio) – Harnessing ‘big data’ to accelerate discovery in the biological, biomedical and health sciences (A partnership between the UCLA College and David Geffen School of Medicine at UCLA). The rebirth of the Mildred B. Mathias Botanical Garden at UCLA – A living museum of thousands of rare and unusual plants, enhancing plant research and education for the benefit of the campus community, residents of Los Angeles and visitors. The Mentor-Professor Initiative – Recruiting outstanding scientists to UCLA Life Sciences who have also shown a commitment to mentoring students from under-represented and underserved groups in the sciences. 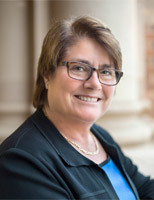 Victoria Sork was appointed Dean of Life Sciences in the UCLA College of Letters and Science in 2009. From 2004 to 2009 Professor Sork chaired UCLA’s Department of Ecology and Evolutionary Biology, where she has been on faculty in this department and the Institute of the Environment and Sustainability since 2002. Elected in 2004 as a fellow of the American Association for the Advancement of Science, she has conducted pioneering research in the field of landscape genomics, which integrates genomics, evolutionary biology and conservation science. She is particularly concerned with the ecological and genetic processes that will determine whether California oaks will tolerate climate change. Through studies for tree species in California, eastern US, and the tropics funded by the National Science Foundation and other agencies, her research has yielded more than 100 publications in major evolutionary, ecological, and environmental journals as well as large number of presentations at national and international conferences, symposia and seminars. She is an eclectic and passionate teacher, a dedicated student mentor, and a reputed administrator. A native of Los Angeles, she holds a Ph.D. in biological sciences from the University of Michigan-Ann Arbor. She earned a B.S. in biological sciences with honors from the University of California, Irvine.